What is a slight departure from his previous works is the use of several vocal tracks throughout this film – Maybe this is the new hot trend in feature length anime films in Japan right now? Because “I’ve Always Liked You – Confess Your Love Committee” (which I reviewed here) also has about a half dozen vocal tracks. – Kimi no na wa has about 3 or 4 – and they are used to help convey key scenes and emotions throughout the film. — In fact all of the music, even the instrumental tracks are very “emotional”. I loved the music in both of these films and it really sets them apart from a lot of other anime movies out there. Geeky: 3/5 – The theme of time travel is one that many geeks enjoy; the production values in terms of animation and sound effects, voice acting, and music are all very high – however, this is a slow paced shoujo, with little to no action until about the last 40 minutes of the nearly 2 hour long film. Sweetie: 5/5 – The theme of fated lovers and the suspense and drama throughout this anime make it a hit with anyone who loves slice of life or shoujo. The numerous vocal tracks as well as the heart-stirring instrumental themes also play on the viewer’s emotions. The animation is simply gorgeous and draws you right in as well. Story: 9/10 – The story follows 2 main characters, a boy named Taki, and a girl named Mitsuha, who switch places when they fall asleep. It’s not every night, and happens at random times. When it first begins happening neither one can remember or realize what’s happening. They begin leaving notes for one another, on their phones, in journals, or even writing all over their bodies. This helps them learn more about eachother and helps them adjust when this change suddenly happens. They also try to spend as much time helping eachother when using the other one’s body. Of course the gender-swapping thing is prone to some fanservice and comedic bits as well. As they grow closer, and as more of the story is revealed, you learn that Taki must remember Mitsuha to save her and her village from a terrible fate. The problem is, that as they grow closer, they also begin to lose their memories and forget one another. Their dreams seem much more like dreams and less and less like reality, and soon time begins to pass them by. Will Taki remember Mistsuha before it is too late? 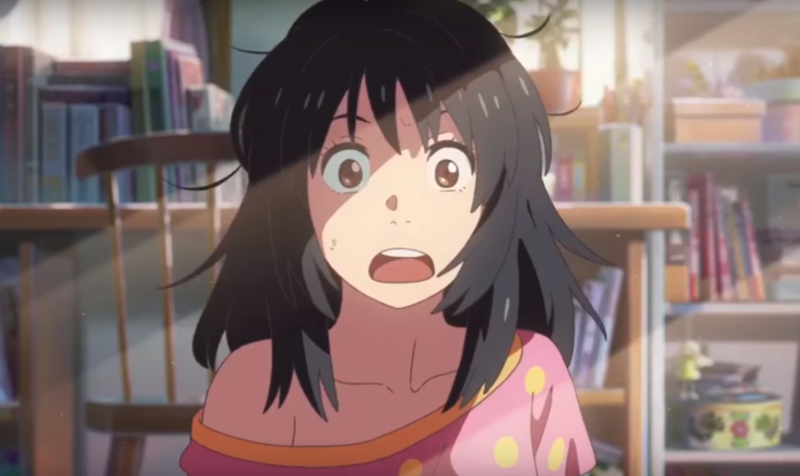 Characters: 9/10 – Mitsuha is from a small village deeply rooted in tradition and culture. Taki is from the city. Both dream of escaping their day-to-day routines. There are several other minor characters, but most of the screen time goes to our two love birds. Mitsuha’s friends and family get way more screentime than Taki’s friends and family. Mitsuha lives with her grandma and younger sister. Mitsuha is responsible for helping to weave hand braided cords. Her grandma explains these cords represent the threads of time, and explains how time can unravel and reconnect in mysterious ways. Mitsuha also is training as a shrine maiden and prepares a special offering for the gods at the upcoming festival. Mitsuha’s bestfriends are another couple from her school. They become instrumental later in the film to helping Mitsuha orchestrate her plans to try to save the village. Taki lives with his father. It appears his father works a lot and is busy so Taki is alone a lot. Taki also has 2 best friends, and a slightly older coworker, but they are far less instrumental as far as plot devices go. They serve more as comedic relief and love rivals. Would have liked to see Taki’s friends and family fleshed out more to give this 10/10. However, the characters – especially our two love birds, really grow significantly throughout the film thanks to sometimes unwanted meddling from eachother when borrowing the other’s body. And of course we get to watch them face hardship and unravel the mystery of what is happening when they switch places. Best of all, we get to watch them come to know one another and develop feelings for eachother which is the biggest catalyst in their coming of age and beginning to change. From start to end, 8 years have passed, so we see them grow throughout their incredible journey. Artwork: 4/5 – The animation as mentioned is really beautiful. The character designs almost have a retro vibe I think, kinda 90s looking. That, combined with the gender-swapping theme kinda harkens back memories of Ranma 1/2 or similar older anime. I’m not sure if this was intentional, but it was a unique approach. The character designs also remind me slightly of studio ghibli in that they are slightly more realistic and less “anime-ish”. But it’s the backgrounds that are just super lovely. The sky, the trees, the lakes, clouds, and even the cityscapes of Taki’s home town in Tokyo. They feel so realistic and lifelike, but yet have a gorgeous mysterious dreamlike feeling to them. Voice Acting 5/5 – The voices felt super natural, which helped carry the emotions, suspense, urgency, and frustrations of the two main characters. The supplemental cast was also spot on in delivering the lines for their roles.